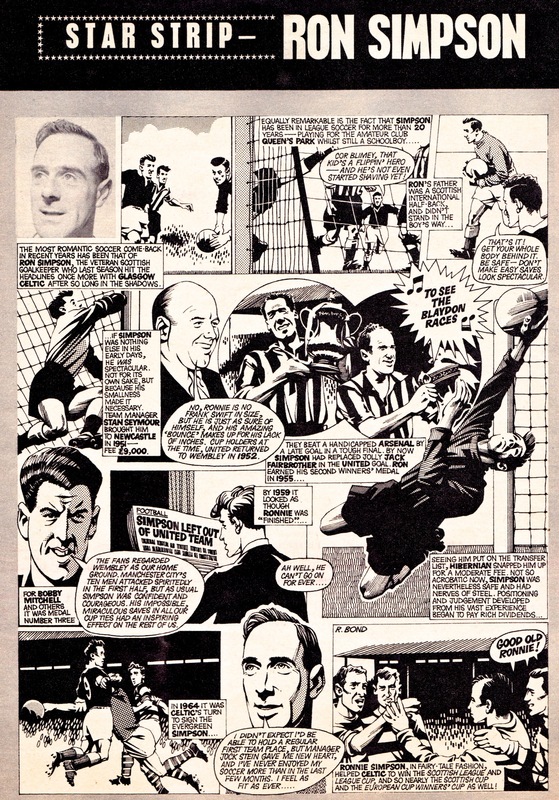 Today’s Star Strip features the Newcastle United and Celtic goalkeeping legend, Ronnie Simpson, a player famous for the remarkable longevity of his career as well as his fine goalkeeping talent. Simpson’s career started just after the end of the War with the amateurs of Queens Park and he made the very short move to join Third Lanark four years later. After just 12 months at Cathkin Park, Simpson was heading south of the border to Newcastle United who paid £8,500 for his signature. Simpson spent nearly a decade at Newcastle and was a key part of their famous FA Cup winning teams of 1952 and 1955. With his career apparently winding down, Simpson returned north for a spell with Hibernian in 1960 and then on to Celtic four years later. Expected only to provide experienced cover for John Fallon, Simpson soon took over as Celtic’s first-choice keeper and would enjoy an amazing Indian summer at Parkhead under Jock Stein. Few players are fortunate enough to win a European Cup medal and even fewer manage this at the ripe old age of 36. Celtic’s 1967 European Cup win with Simpson in goal was undoubtedly his career highlight and he missed the club’s other European Cup Final in 1970 through injury in what was his last season before retiral. This particular Star Strip was published in 1966 and while it alludes to Simpson’s remarkable longevity and bounce-backability, no-one could have anticipated that a keeper in his mid-30s still had his best years ahead of him. BTLM is especially curious about the frame on the top line that references Simpson’s emergent career in Glasgow. For reasons unknown, the accompanying crowd speech-bubble commentary from what would be a Glaswegian terrace seems to be supplied by a proper Cor Blimey Guv’nor cockney!